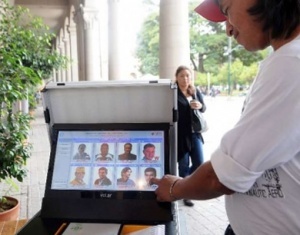 In recent weeks, was felt strongly the call for civil and political organizations in Switzerland, Mexico and Spain to implement electronic voting as a solution tosuffrage for nationals living abroad. The voting rights of migrants have often been diminished by the difficulties in exercising the voting outside the country of origin. Although automation of the vote in this case is not new, during the last decade, several European countries – Estonia, Austria- evaluated the feasibility of using voting technology for the emigrants, so far only has advanced in its implementation Switzerland. The Federal Council of the nation, recently approved to use the e-voting or Internet voting for expatriate citizens in the elections of next October 23. Voters abroad often face difficulties in registering and validating their status as voters, mainly the need of some nations to have legal residency or for fear of revealing their immigration status. But coupled with this, there are obstacles of a technical and logistical hinder the democratic exercise. At this point, consider the receipt of election materials in these diplomatic wrong and location of polling stations, which are usually the consulates or embassies located at great distances from where many citizens lives. In response to this reality, Switzerland took the step, and in October that will allow 20,000 of the 135,000 people resided in overseas vote via Internet. 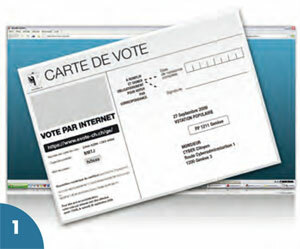 According to the electoral governing body in each state or province, the inline schema provides that voters receive, via the postal service, its electoral material and a six-digit password, so that once connected the Web designated for the process, the voter enters to accessthe ballot and cast the vote. For this to be validated, the citizen must indicate your date of birth and transcribe a secret four-digit code contained in these documents to vote. This model is being promoted by the European Federation of the PSOE (Spanish party), indicating that the model of e-voting would increase, facilitate and ensure the participation of many Spanish citizens abroad. The automation of the vote to immigrants has been tested in this country, specifically in the region of Cataluña, where in 2003 a pilot program tested electronic voting for elections of parliament and took 23 000 voters living in Argentina, Belgium , Chile, USA and Mexico. Popular pressure is also felt in Mexico this month, when the Organization of Migrant delivered to the Electoral Affairs Commission of the State of Tlaxcala, a proposal for legal reform that progress in introducing electronic voting for overseas residents, and remove thus, the exclusion of thousands of citizens with equal rights of those who still live in Aztec territory. Argentina has been studied for years the possibility of modernizing the vote. Some provinces already have legislation that provides automation processes and some localities in 2011 blunted its use. However, for now, there is no national government plan, that puts on a near horizon the adoption of the technology that updates the vote of this southern nation. Media, politicians, authorities and citizens dicsuss on what stops the impementation of electronic voting in Argentina. Some of the answers are: fears, doubts, economic and political interests and even ignorance. Probably all of them are part of the reality, yet the country has witnessed a trickle of automated suffrage that has been overcoming the resistance, but the road is still long. The discussions between experts and politicians intersect with the electoral process. This year there will be municipal and regional elections, and presidential election in October. Meanwhile, several provinces are continuing the search for technological solutions that meet their needs to automate the vote. There are various national and international companies who have offered their services to Argentina. Foreign capital include the Spanish company Indra (already has experience in the country) and Smartmatic (has implemented electronic voting in countries like Venezuela and the Philippines) as well as national companies such as Magic Software Argentina (MSA), Altec and Allpa. There are many options, but what the country needs is decision. Not long ago in Buenos Aires experts and officials met to discuss electronic voting. Among the findings one of the highlighted conclusions was that the public will be open to make the transition between voting and voting tech manual, and that there will not be a national law to establish this form of voting, but each town would have autonomy when deciding which path to take. La Rioja and Catamarca are on that path. Slowly the route that will face Argentina’s decision to automate their elections has been clearing. In this country since 2003, testing pilots have taken place and in some regions they have already made ​​a formal electronic election (Pinamar), but the selection of the system to underpin the introduction of electronic voting nationwide is still incipient. Technological solutions the successful tests are available. An oficial decisión is what’s needed to give Argentina the opportunity to have a mechanism to provide security, speed and electoral transparency to its citizens, a to compete with their South American peers, specially those that are very advanced in the deployment of automated voting. The Venezuelan electronic voting system has been used as an example by institutions and government, because of its safety and reliability, but continues to improve. The Venezuelan National Electoral Council is on track to pay off a few debts it has with voters, to enhance the voting experience of citizens with physical or motor limitations. In recent years, Smartmatic, the leading provider of technology for the Venezuelan electoral body, has offered its voting technology to other countries, to facilitate voting for people with disabilities. This year, the CNE has continued its work with the National Council for Persons with Disabilities (Conapdis) to include all people with any limitation on the voting. For this, the registration and data-updating day in the current Electoral Register process, involves explicit call to voters’ assistance. For this, 1300 mobile points were deployed in the 24 Venezuelan states or federal agencies, which will operate until December 2011. The main leader of the CNE, Tania D’Amelio explained that in the data fields that include the Electoral Register, containing the intended to specify whether the voter has a physical or mobility disability. She also said that Conapdis played a key role, since that agency was responsible for naming and defining the limitations and disabilities to the fields of the register of voters. Also, as D’Amelio explained, who also belongs to the Commission on Civil Registration and Electoral CNE, Conapdis will provide incentives to citizens with disabilities to come to the sites allocated by the electoral body, to update their details. Completed the process, the CNE estimates that at the beginning of 2012 it may have an approximate of the voters who may have physical and motor disabilities to efficiently dispose of the 12.000 SAES 4200 voting machines that will be acquired for next year’s presidential election. These machines have adaptations that allow people with limitations, to exercise their right to vote with dignity. The machines are designed to address limitations as low or null literacy, ocular diseases, mental illness, and motor problems, among other conditions. Voters are led throughout the voting process with built-in audio system to cast their votes independently. For this, the machines have a control that includes headphones, buttons with different shapes, colors and sizes, Braille display and a device to sip and puff for voters with mobility limitations. Additionally, for people with limited proficiency in the official language of the country, computers can be easily enabled in multiple languages, if the electoral power of the country so requires. 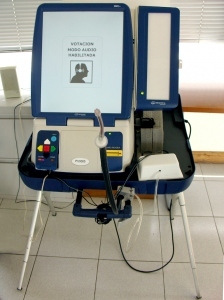 Technological improvements of voting machines that will be first used in Venezuela, will impact the persons with disabilities safety, as they will no longer have to rely on the help of others to vote. This development will constitute a strong pace to raise the back of the automated system, increase participation and strengthen the country as well as a reference in the use and application of electronic voting in the hemisphere.